Zhabei is a major educational hub. It has over 150 academic institutions, and offers economical lodging for foreign students on a tight budget. 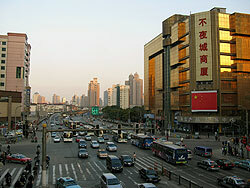 Zhabei is the Silicon Valley of Shanghai, home to firms doing development and research in the IT industry. Lit up in the evening, it is sometimes called the Ever-Bright City. Zhabei has played an important role in Shanghai’s long history and is considered one of Shanghai’s nine central districts. It is a stone’s throw away from two international airports and many of Shanghai’s business districts. Zhabei also boasts the largest green space in the city, Daning Lingshi Park.